Your Dreams Coming True In The Kitchen: Meat Torpedos With Garlic And Mint....Byzantium On Your Plate. Meat Torpedos With Garlic And Mint....Byzantium On Your Plate. Before presenting my today's recipe, I would first like to share with you a little bit of history. The origin of this recipe is Byzantine; meaning that it was being cooked by Greek families well before the first millennium A.D. and well before the Ottoman Empire invaded and took over Byzantium in 1453 A.D. which included what we know of today's Greece. Cities like Constantinople now Istanbul, and Smirni now Ismir were Greek. They had imported various spices from the Middle and Far East which were used in their cuisine. It is known that Greece was always a leading country in shipping. All the places were inhabited by Greeks who established their identity all through these centuries. Therefore the food was basically Greek and the Ottomans learned it and continued it. 1922 marked the year when a mass catastrophic exodus was imposed on the Greeks living in Smirni obliging them to flee to Greece. They took their culture and cuisine with them. 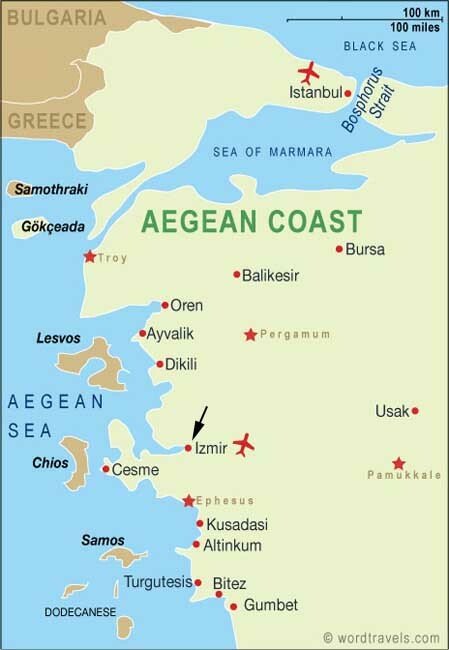 The region around Constantinople to Smirni is generally called Asia Minor (please see map above) and the Greeks originating from there are considered, by Greeks of Greece, as well read and spoken, and very good in the kitchen. Sou-tzou-ká-kia Smyr-néi-ka ( Smirni Sausage) is what we are having today. I remember my mother cooking this dish when I was little and like it very much. - 500 gms of basmati rice prepared as usual. - 1 kg of lean ground beef. - 3 cloves of garlic mashed into a paste. - 1 Tbsp. olive oil (extra virgin Kalamata olive oil if possible). - Olive oil to fry the oblong meat balls. - 250 gms of grated tomatoes with juice. - 1 Tbsp. tomato paste. - 1 Tbsp. of freshly ground cumin powder. - 3 slices of stale bread soaked in milk. * This is a personal touch. minutes wetting your hands every now and then. The more you the ground beef the fluffier the meat balls will become. - Shape into 3 inch oblong meat balls and roll in the flour. - Fry in oil until they are brown on all sides. Set aside. - Stir fry the onions in some oil till they become soft. - Add tomato paste and grated tomato. - Add chili, the cumin powder and let simmer for 3 minutes. - Add the fried meat balls and continue cooking both till they are done. - Your rice is also ready.